Gamja jorim is a braised potato dish. It’s very popular as a side dish at home and restaurants and for home-packed lunch boxes. 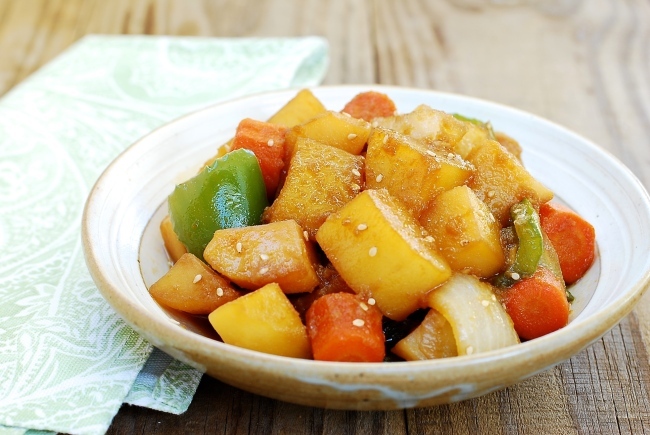 The potatoes are braised in a slightly sweet, soy-based sauce until the sauce is reduced and the potatoes are tender. It’s a filling, inexpensive dish we all grew up on. This dish can be made with a few staple ingredients in your pantry. I used a carrot and some green pepper for colors, but you can use other colorful vegetables of your choice or simply omit them. You can also add some gochujang (Korean red chili pepper paste) and/or gochugaru if you like to add a little heat to the dish. Peel and cut potatoes into about 3-centimeter cubes. Soak in cold water for a few minutes and drain. Cut the carrot, green peppers onion into big chunks. In a small bowl, combine the soy sauce, sugar, rice wine, garlic, corn syrup, pepper and water. In a small pot, saute the potatoes and carrots in cooking oil over medium heat for 4 - 5 minutes. Add the sauce mix and bring it to a boil over high heat. Cover, and reduce the heat to medium and cook until the potatoes are tender (about 7 to 8 minutes). For more recipes, visit www.koreanbapsang.com.